GarageBand is probably one of the most popular music apps out there. Several teachers are using it with their students in class. 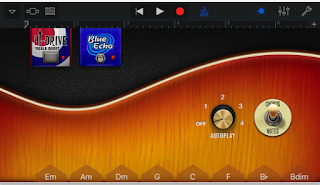 Recently, Apple Education released a new interactive guide titled ‘GarageBand for iPad Starter Guide’ designed specifically to help teachers and students play and record audio compositions on their iPad. The guide includes detailed guidelines and instructions to walk learners through the process of creating narrative soundscape using a wide variety of hands-on activities and exercises. Whether you want to compose songs to use in vocabulary teaching, compose audio to integrate in your own animated videos or add soundtracks to your own documentary film, this interactive guide will definitely help you make the best of GarageBand in your educational projects.